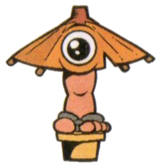 A Karakara is an enemy from Super Mario Land 2: 6 Golden Coins. These one-eyed umbrellas are found near the start and the end of the second level in the Pumpkin Zone. They will unfold and launch into the air, then float downwards while moving back and forth. A Karakara can be defeated by a jump or a fireball. They are based on the Karakasa or Kasa-Obake, a yōkai spirit from Japanese mythology. Two Karakara, one folded up and one unfolded. An image of Karakara with its name next to it. Page 6 from the Super Mario Land 2: 6 Golden Coins arc of KC Deluxe. Karakara Based on the name of Karakasa. This page was last edited on December 30, 2018, at 17:18.